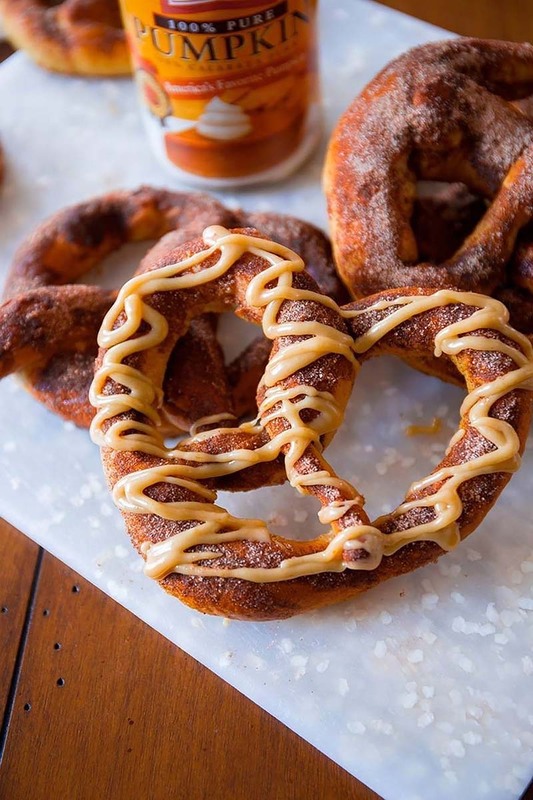 Pumpkin-spiced pretzels, baked to soft perfection, and covered in a brown sugar pumpkin praline glaze. Make the praline topping first: Add the brown sugar, butter, and milk to a small saucepan over medium heat. Continuously whisk the mixture until smooth and bring to a boil. Allow to boil for 1 minute without stirring. Remove from heat and stir in the pumpkin and confectioners' sugar until smooth. Set aside and allow to thicken for at least 20 minutes. Preheat oven to 425°F. Line two large baking sheets with parchment paper or silicone baking mats. Set aside. Make the pretzels: Whisk the yeast in 1½ cups warm water. Allow to almost fully dissolve, about 1 minute. Whisk in the salt and brown sugar until combined. Slowly add the flour 1 cup at a time. Mix with a large spoon until dough is thick and no longer sticky. Do not add too much flour or the pretzels will not be soft. After 3-4 cups of flour, poke the dough with your finger. If it bounces back, it is ready to knead. If not, add a bit more flour. Turn the dough out onto a floured surface. Knead the dough for 3 minutes and shape into a ball. With a sharp knife, cut into 7-8 sections. Roll each section into a 20-inch rope with an even diameter. Take the ends of the rope and form a giant U shape. Take the ends, twist them, and bring them in towards yourself creating a pretzel shape. Whisk 9 cups of water and the baking soda together in a large pot. Bring to a boil. Place a pretzel onto a large slotted spatula and dip into the boiling water for 30 seconds. The pretzel will float. Lift the pretzel out of the water and allow the excess water to drip off. Place pretzel onto prepared baking sheet. Repeat with the rest of the pretzels. Bake pretzels for 10 minutes. During that time, make the topping by melting the butter in a small bowl. Mix the granulated sugar and spices together in another small bowl. Remove the pretzels from the oven and brush each top with the melted butter and generously sprinkle with the sugar/pumpkin spice mixture. Place back into the oven and bake for another 5 minutes. Remove from the oven and sprinkle with more sugar/pumpkin spice if desired. Drizzle the praline on top of each pretzel. Serve warm or at room temperature. Pretzels may be stored in an airtight container in the refrigerator for up to 3 days. Unglazed pretzels freeze well, up to 2 months.